Olivebridge Midwifery (OM) OM Moms group meets the first Wednesday of every month from 10am to noon. All are welcome, pregnant or not, moms, dads, babies, siblings, grandparents,and friends who gave birth with a different provider. The OM MOMS group gives people a chance to meet each other, make new like-minded friends, talk about pregnancy, birth and baby questions. Generally there is a person who will introduce a concept such as infant massage, zero balancing, perinatal counseling, essential oils, etc. who may speak for 30 mins or so, the rest of the time the topic is up to the people who come that week. Examples: what is your favorite baby carrier, when to introduce solid foods, what is this baby acne about, diapering, breastfeeding, and sleeping questions are discussed. 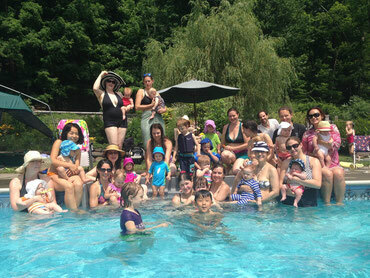 In the summer time, weather permitting, we hold Om Moms outside around the salt water, heated pool. At times, we are lucky enough to have an infant swimming instructor who offers advice and gives lessons. Sometimes teens, who love babies, offer to hold your baby while you go for a swim. Some times in October we try to have an Octoberfest potluck, on a Sunday afternoon, so the whole family can come and meet other families, if they choose. An added benefit for me is that I have an opportunity to see the babies, children and parents growing up and I get a chance to hold some babies, some that I met when they were inside their mom's womb. Facebook and technology are great but come join us for interactive fun in person! If you can't make it, you can find me on Facebook at "Olivebridge Midwifery", OMBabies, or Connie Kieltyka.